On behalf of the TESOL Greece Board, I wish you a Happy and Promising New Year, full of joys and challenges. This is a special year for us all. 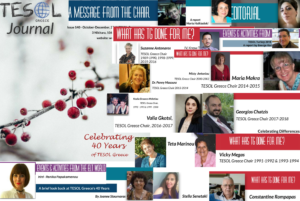 TESOL Greece is celebrating its 40th anniversary and we are getting ready for an invigorating, full-of-creative- and-innovative-ideas annual convention. 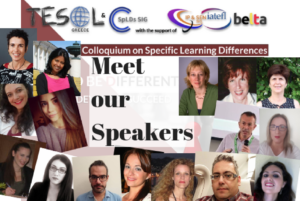 Join us on March 2nd and 3rd at the Titania Hotel in Athens and help us welcome our plenary speakers, Luciana de Oliveira, Barbara Hoskins Sakamoto, Malcolm Mann and Dorothy Zemach, as well as fifty international presenters from Greece and foreign countries from as far as Japan and Argentina. 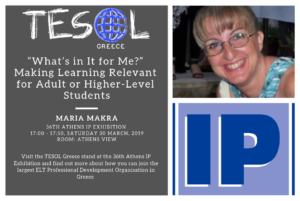 Have fun, dance and celebrate at the TESOL Greece dinner party on March 2nd, visit the fantastic and extensive Exhibit of Books & Teaching Materials and enjoy the Luke Prodromou English Language Voice Theatre. 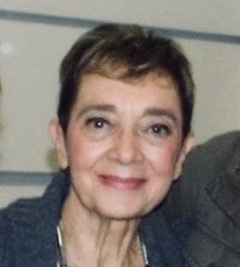 Meanwhile, just so we can all get ‘prepped’, come to the TESOL Greece-HAEF Pitta Cutting Event on February 10th and ‘feast your ears and soul’ to all ways of Communication with Agnes Alice Mariakaki and six young and promising speakers from TESOL Greece and HAEF. This TG year, 2018-2019, has been a busy year, but it’s been a beautiful one and your presence at the Sunset Walk around the Ancient Agora last June, the September Start of the Year Big SIG Event and the Specific Learning Differences Colloquium last November has filled us with joy. We are looking forward to seeing you in February and March. Come celebrate TG’s birthday and bring a gift: one new member to help our association become bigger and stronger.